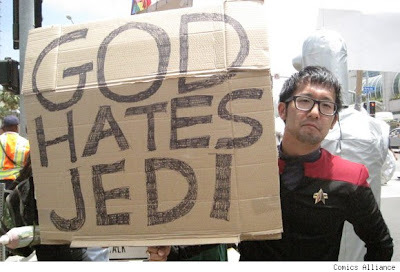 Home » awesome duuuuuuude , comic-con , fred phelps , weird news , westboro baptist church » What happened when Westboro Baptist Church tried their antics at Comic-Con? 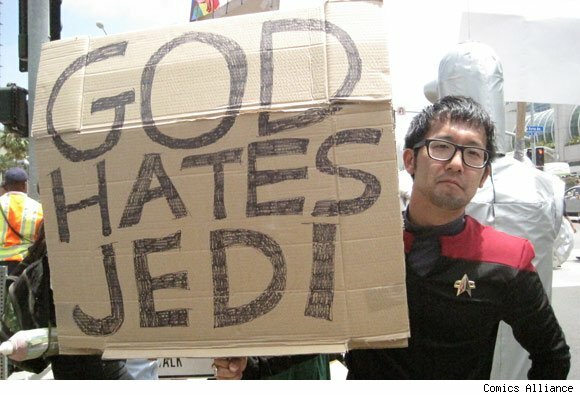 What happened when Westboro Baptist Church tried their antics at Comic-Con? 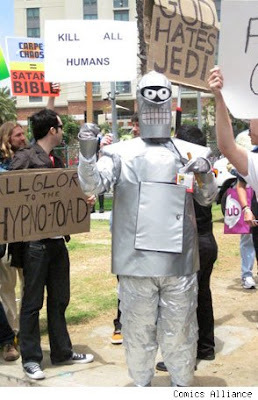 ...but the geeks of Comic-Con certainly knew how to respond in kind! ComicsAlliance has a bunch more photos of the counter-protest, which also included numerous "robots, magical anime girls, Trekkies, Jedi and...kittens?" I think the WBC was there, because they may have found out that Kevin Smith was gonna be there to talk about his upcoming horror film, Red State, which has Michael Parks playing a character that his based on Fred Phelps. No they were there looking for a camera, as all cults seem to do, how else do you draw more dysfunctional people to your banners then gaining access to free advertisement via a protest. I'm surprised Johnny Robertson hasn't thought of doing something like this!